The Department of Biology at UNCG is committed to providing excellent and comprehensive instruction at both the undergraduate and graduate levels. We offer a full range of courses to students pursuing a degree in Biology or Medical Technology, as well as to non-biology majors interested in the biological sciences. Biology majors have many options available to them, including the option to pursue degree concentrations in Biotechnology, Environmental Biology, or Human Biology. Biology students are encouraged to gain research experience through independent study with a faculty member, and to develop strong communication skills with writing- and speaking- intensive lecture and laboratory courses. Graduates of the Biology program at UNCG find employment in a wide range of fields and are well prepared for further study in graduate school or in health related professions such as medicine, dentistry, and veterinary medicine. The Department’s excellence in education is complemented by highly active research programs in environmental and behavioral ecology, evolution, population biology, and cell and developmental biology. Biology faculty members publish regularly in leading scientific journals and have earned national and international prominence with their research activities. Moreover, faculty in the Department have been very successful in obtaining external funding to support their research and have been awarded research grants from various agencies including the EPA, NIH, NSF, and USDA. Visitors and prospective students are welcome to stop by the Biology Department office, 312 Eberhart Building; (336) 334-5391, to arrange a tour of our teaching and research facilities. 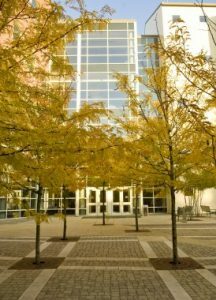 Research faculty offices and labs are located in the Eberhart Building, while most classrooms, teaching laboratories, and teaching faculty offices are located in the Sullivan Science Building (pictured). UNCG administers an extensive financial aid program that includes scholarships, grants, loans, and work. Eligibility for programs based on need is determined by analysis of family financial information. The University’s Financial Aid Office administers all programs. For graduate students, the Department of Biology offers graduate assistantships on a competitive basis. Support is in the form of teaching or research assistantships. Additional information may be obtained from the Director of Graduate Studies in the Department, Dr. Paul Steimle. The deadline for applying for graduate assistantships is April 30. Admission of undergraduates to UNCG is based on an evaluation of an applicant’s secondary school or college record, overall grade point average, and SAT or ACT scores. To begin the application process, prospective undergraduates should contact the Admissions Office, Armfield-Preyer Admissions and Visitor Center, 1400 Spring Garden Street, Greensboro, NC 27412 or call (336) 334-5243. Prospective graduate students in biology must have completed an undergraduate degree in biology or a related field with a good academic record. To be considered for admission, students must submit an application, scores from the Graduate Record Examination general test, undergraduate transcripts, three letters of recommendation, a one-page statement of interests, and the application fee specified by the Graduate School. Prospective students may visit the Graduate School website for more information or to apply online. The Graduate School mailing address is 241 Mossman Building, 1202 Spring Garden Street, Greensboro, NC 27412; phone (336) 334-5596.